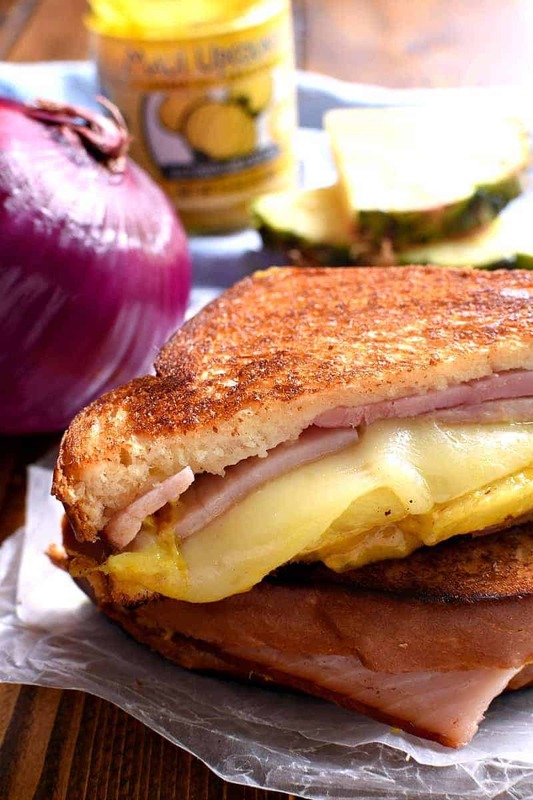 Hawaiian Ham & Cheese Sandwiches are loaded with pineapple, red onion, ham, cheese, and the BEST Onion-Garlic Mustard! A deluxe grilled cheese sandwich with the perfect blend of savory and sweet flavors. 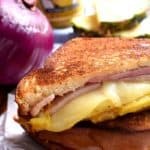 This Hawaiian ham grilled sandwich recipe is a delicious twist on a basic ham & cheese sandwich. So…..spring break is just around the corner. And my kids can’t stop asking where we’re going! They’re desperate for a vacation…even if it’s just to a waterpark. Because all their friends are going somewhere. And apparently we’re the only ones who aren’t. Ahhh, to be a parent of kids who are old enough to compare what we’re doing to what their friends are doing. Honestly, I miss the days when just taking them to the zoo or the bounce place or out for ice cream was enough. Because now…friends are going to Florida and Mexico and Hawaii! And we seriously can’t keep up. And instead of eating out every meal, I’m thinking it would be fun to make some fun food at home! Food from all the places we wish we were going. 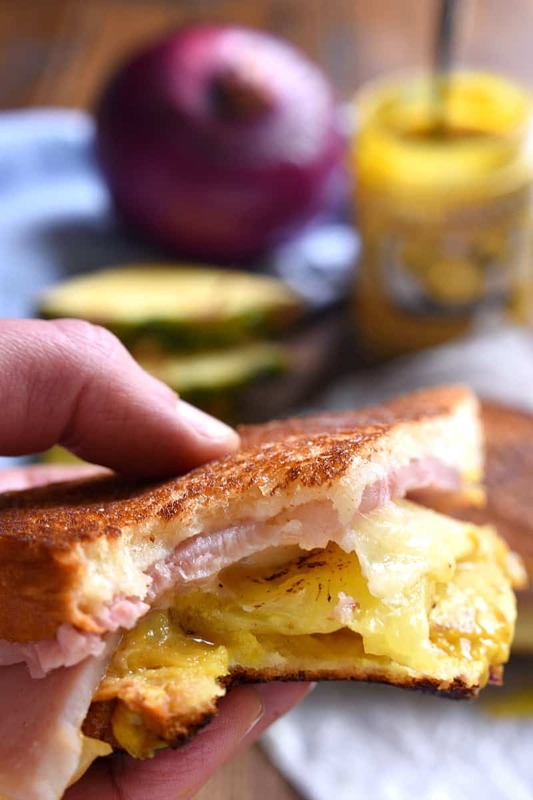 Starting with these Hawaiian Ham Grilled Cheese Sandwiches. We’re going to serve the Hawaiian ham sandwiches with some Hawaiian Cole Slaw. Everyone loves a good ham & cheese sandwich, but this one takes ham & cheese to the NEXT LEVEL. 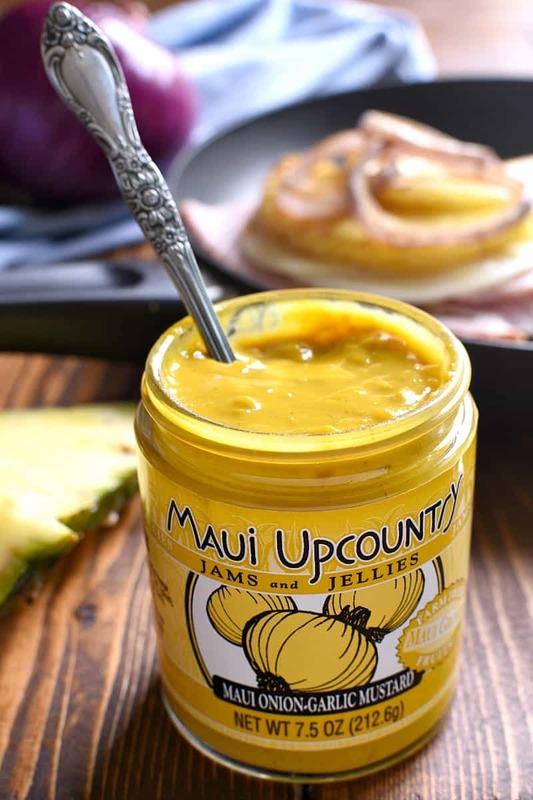 Because it’s loaded with grilled pineapple and red onion and the best Maui Onion & Garlic Mustard, made with onions from Kula, Maui, the home of the famous Sweet Maui Onion. And…King’s Hawaiian Sliced Bread! Which makes all the difference. 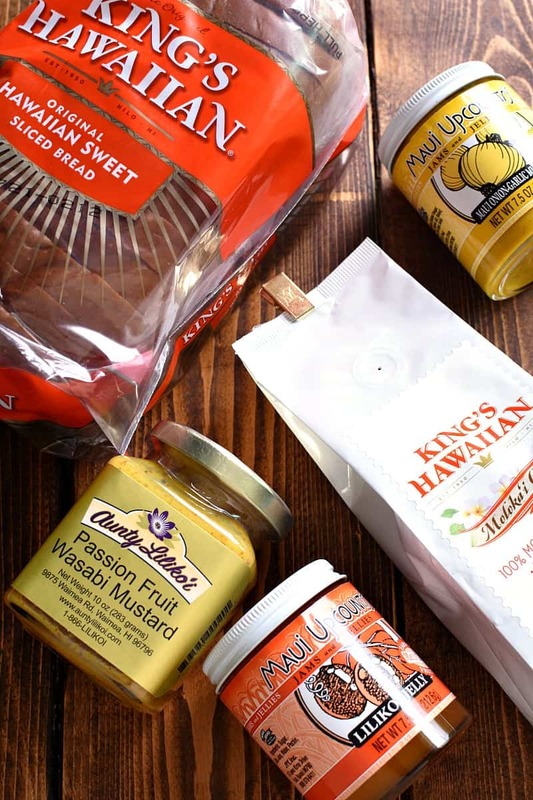 Did you know that King’s Hawaiian has an online store, where you can find SO many delicious Hawaiian products? I’m in love with the selection! And they even have Easter gift packs available so you can share the flavors of Hawaii with the people you love. I’m a huge fan of the Easter Leftover Gift Pack, which includes the yummy onion & garlic mustard, Lilikoi Jelly, Passion Fruit Wasabi Mustard, Moloka’i Coffee, and King’s Hawaiian Bread. They also have an Easter Morning Gift Pack, and they both come with the signature King’s Hawaiian re-usable tote bag. Perfect for Easter gifting and such a DELICIOUS treat! 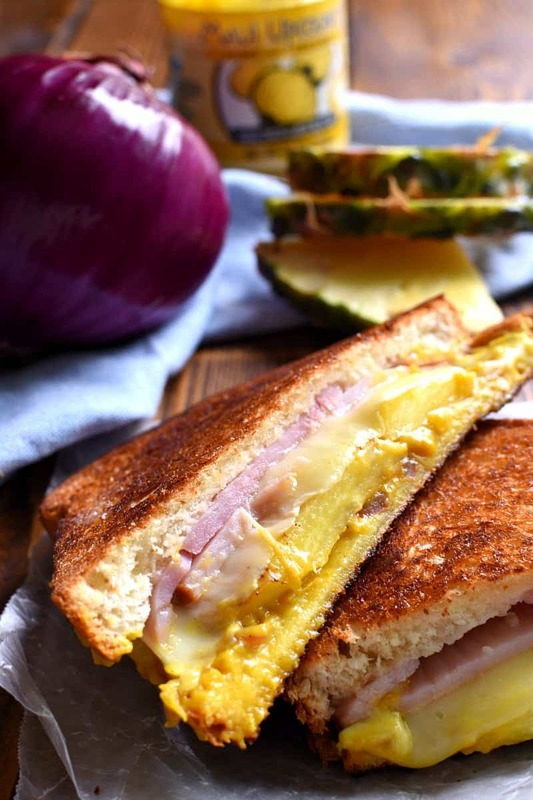 This Hawaiian Ham & Cheese Sandwich is loaded with pineapple, red onion, ham, cheese, and the BEST Onion & Garlic Mustard! It's the perfect blend of savory and sweet, and a delicious twist on basic ham & cheese. Butter each piece of bread; assemble sandwich. I LOVE pineapple. I even love it on my pizza! I’ve never thought to put it on a sandwich! Can’t wait to try this! What a great idea adding a slice of pineapple in there! Love it! What a terrific sandwich! I love that you added pineapple! Yum! This grilled cheese looks so good! 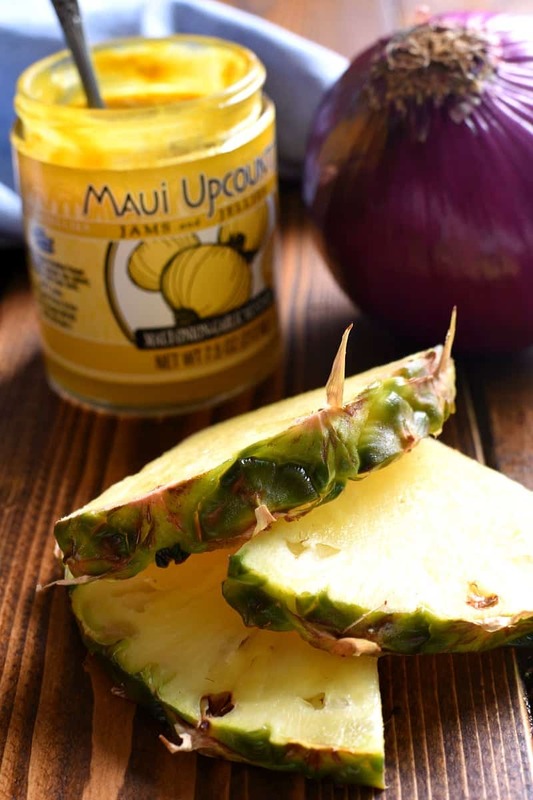 And that Maui Onion Garlic Mustard sounds amazing! This looks so good! What a perfect combination of comfort food and fresh, summery ingredients – the pineapple ia such a great addition! I’ll have to try this recipe! I miss Hawaii so much; this sandwich takes me back! I need to get my hands on some of that mustard! I love staycations and that’s exactly what we did for spring break! That being said, I wouldn’t mind a trip to Hawaii. 😉 In the meantime, I’ll have to dig into one of these sandwiches! This sandwich looks amazing, I’m dying to try that mustard! I had no idea that King’s Hawaiian had an online store! Of course it will work! You are super mom extraordinaire. That sounds cheesy, but it’s totally true. And these sandwiches! They totally make a staycation perfect! These look SO good – my husband would adore that mustard! I love everything about the sandwich – it’s perfect! So what’s on your staycation list?? We’re doing the same over here. I need more ideas!! oh and duh, the sandwich. AMAZING!!! There is no cheese listed in the recipe. What kind/how much do you recommend for this amazing-looking sandwich? Oh shoot! I’m so sorry, Cheryl! I used 2 slices of provolone. I will go back and add it to the recipe! I had NO idea that I could get King’s Hawaiian products online. Cathy, this is life changing for me, because there are a bunch of varieties of their rolls that I want to try, and I can never find them at the grocery store. Your grilled cheese is all of my favorite pizza toppings with glorious cheesy goodness. YUM! I hope your staycation was a big success — I think that was a great idea! Expensive vacations just aren’t necessary to have fun! 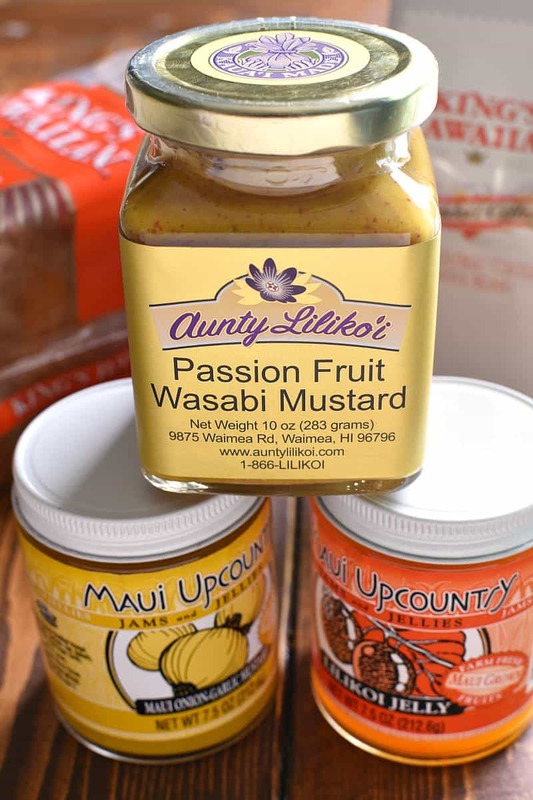 I love Hawaiian flavors and everything from the King’s Hawaiian bread down to the condiments sound amazing here. I would love this sandwich! What an amazing looking sandwich! Is it wrong to want this for breakfast? It looks amazing! I’m so excited to make this!! I’m always looking for something new to make!! Thank you! !